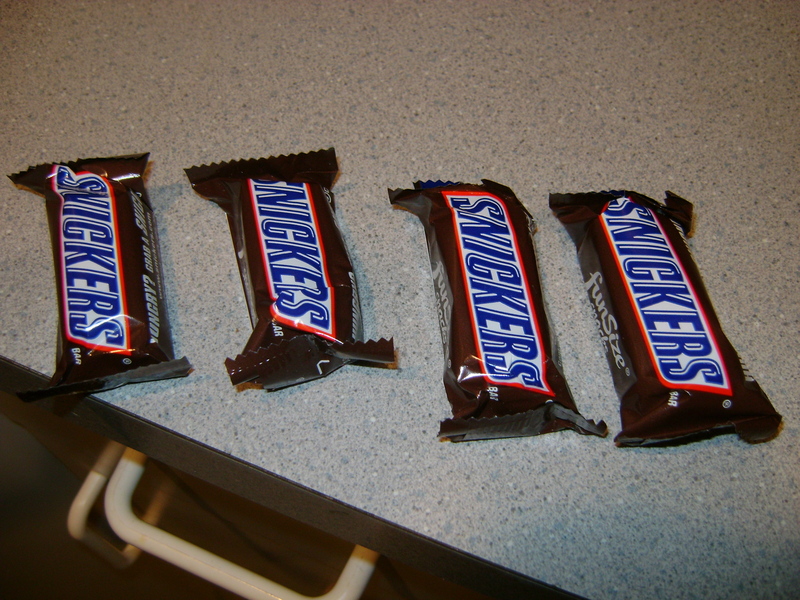 I inherited a love of Snickers from my Mother. My Mom, a nutritionist, of all people!! It’s sort-of a family tradition to freeze all candy, so she has always placed the little fun-sized treats on the freezer door. Naturally, I’ve become HOOKED on doing the same thing. My 85 year old Nana does this too…and that‘s right where all the grandchildren head when we visit her! Have you ever had a frozen snickers? They’re unreal! It’s like eating a caramel filled with peanuts, but it’s easier to chew! They.are.addicting. Needless to say, I try not to buy them for myself too often, because living alone and buying bags of fun-size candy=disaster. For this recipe though, I made an exception. 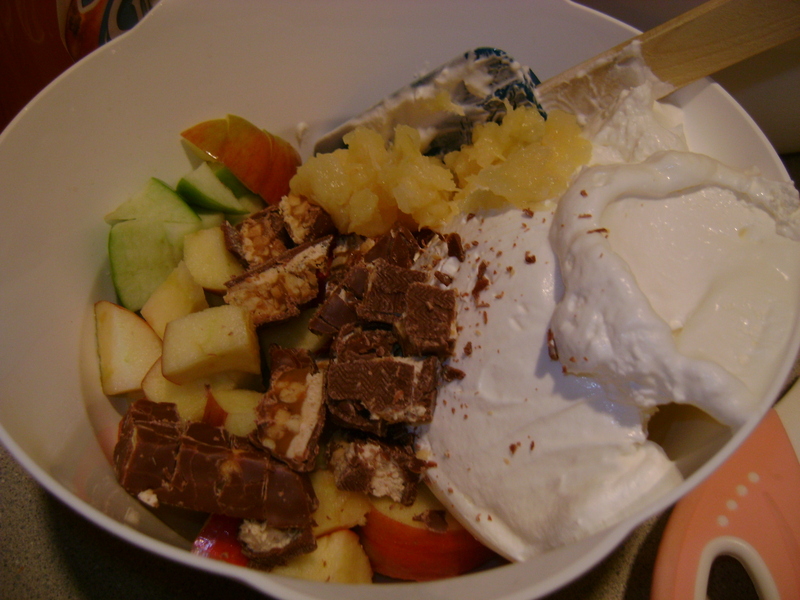 The addition of Snickers to this fruit salad is unreal. Fruit+chocolate=winner. Trust me! 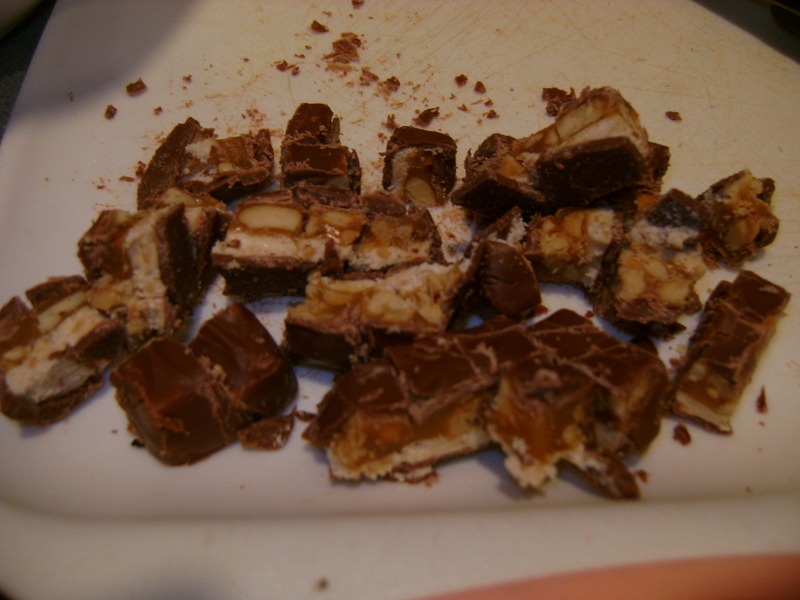 1/2 cups nuts (optional) – I used glazed walnuts! Chop the fruit and snickers. Drain the pineapple. 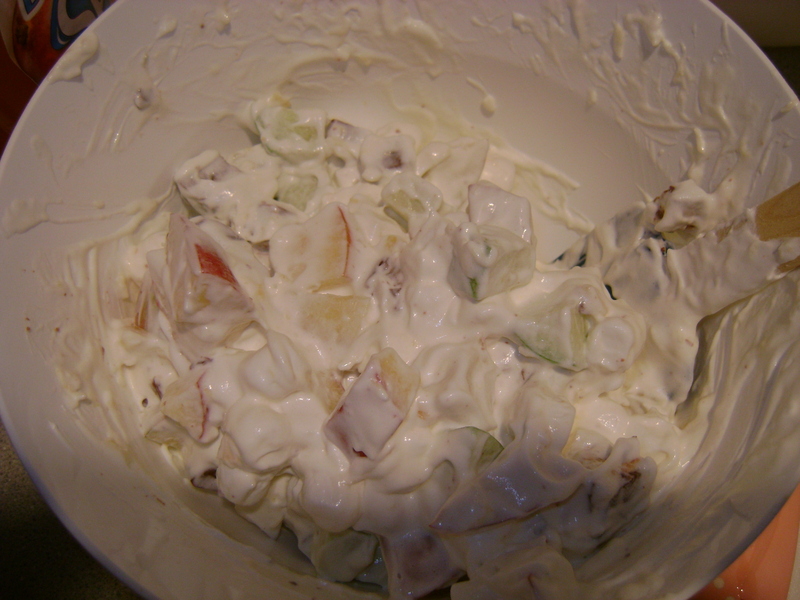 Combine with the rest of the ingredients, and chill for about an hour in the refrigerator. Enjoy!!!!!!! I’ll be enjoying this as a side dish and for dessert tomorrow. You should too! Last fall marked the moment I first tried apple butter. 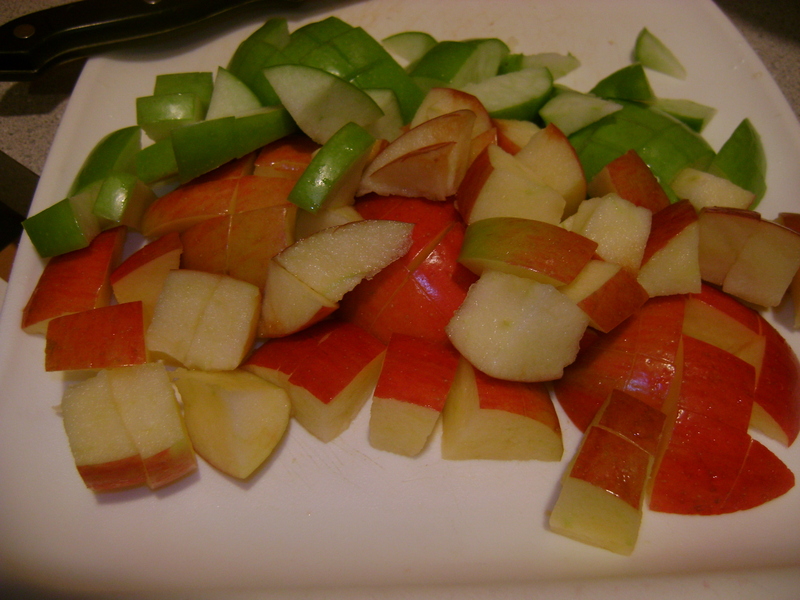 A trip to a local apple orchard sparked my interest in this healthy, sweet spread. The orchard had a shop full of pre-picked apples, cider donuts, and homemade jams and butters. I saw the apple butter and knew it was for me! I first tried it straight from the jar with apple slices, then moved on to spreading a layer over English muffins and toast. Delicious! 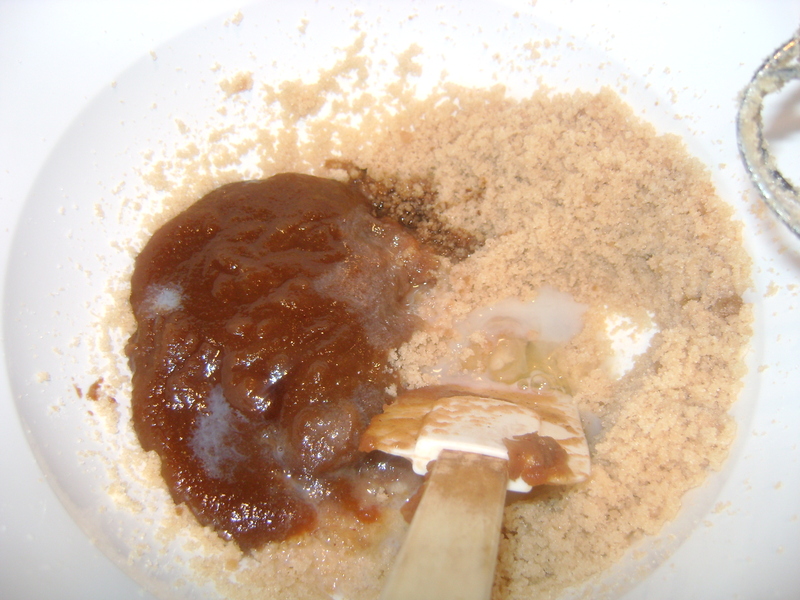 Recently, I stumbled upon a cookie recipe that incorporated apple butter, and I immediately recreated it. Let’s just say I managed to eat the entire pan myself, in less than a week. The sign of a great recipe? I think yes. 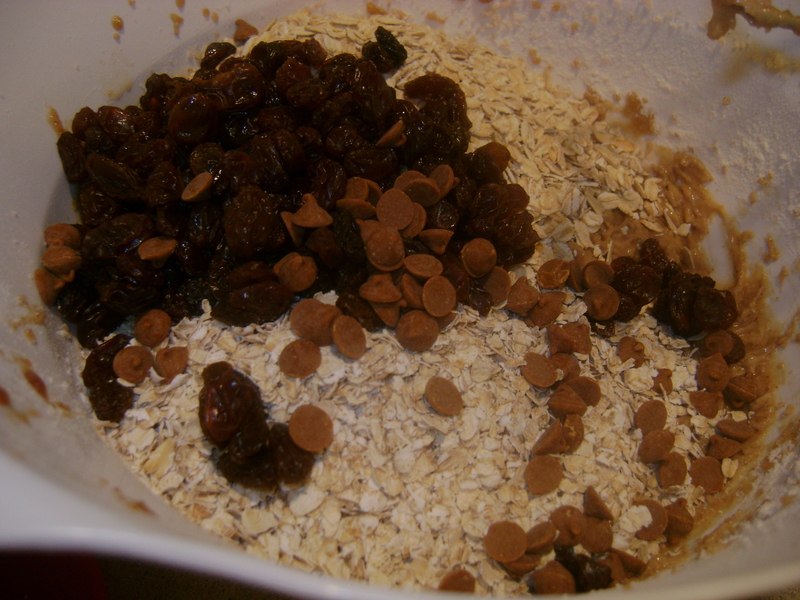 To cut down on dishes ( pathetic, I know), I opted to make these into cookie bars. 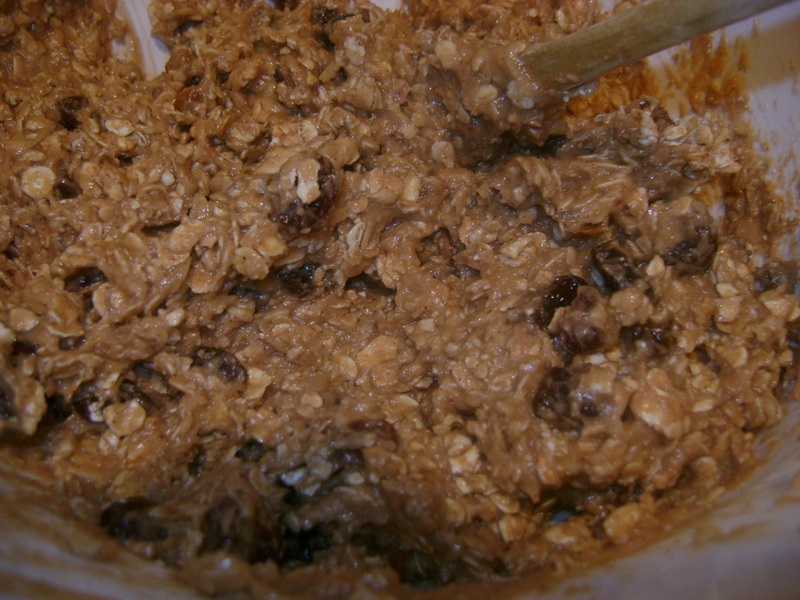 Not only are these healthier than your standard oatmeal raisin cookie (the recipe calls for just a ¼ cup of margarine, along with egg whites, whole oats, and dried fruit of your choice), but they’re also extremely moist, without any butter or grease. They’re moist because of the star ingredient…apple butter! Try these…I promise they don’t disappoint! 1) Heat oven to 350°F. Lightly spray pan with cooking spray. 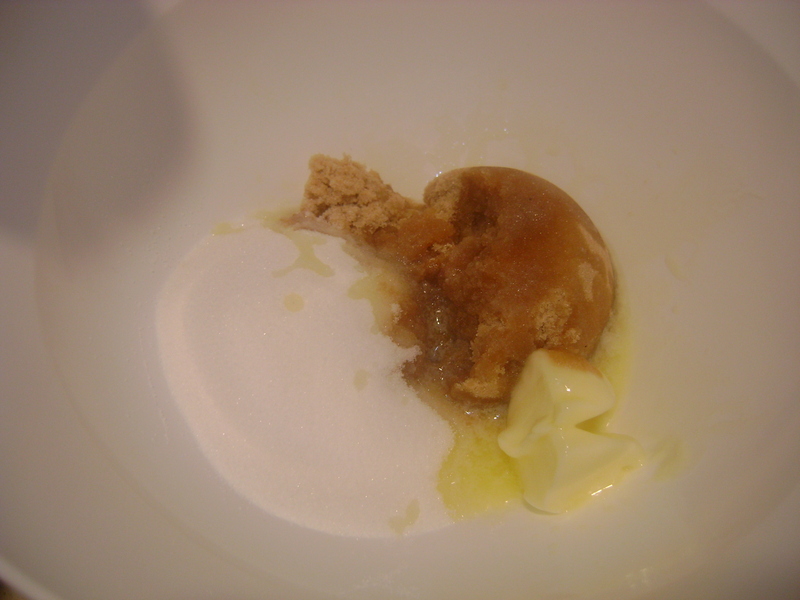 2) In large bowl, beat sugars and light butter with electric mixer until well blended. 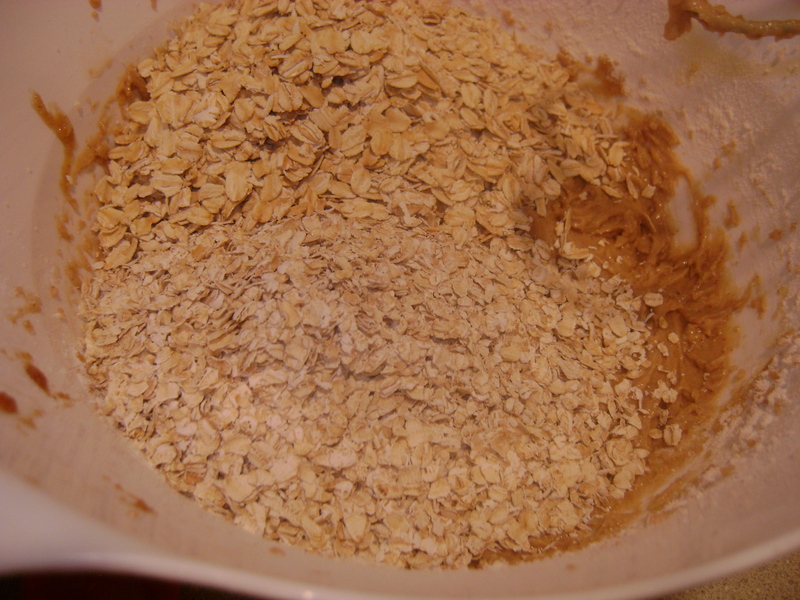 Add apple butter, egg whites, milk and vanilla; beat well. 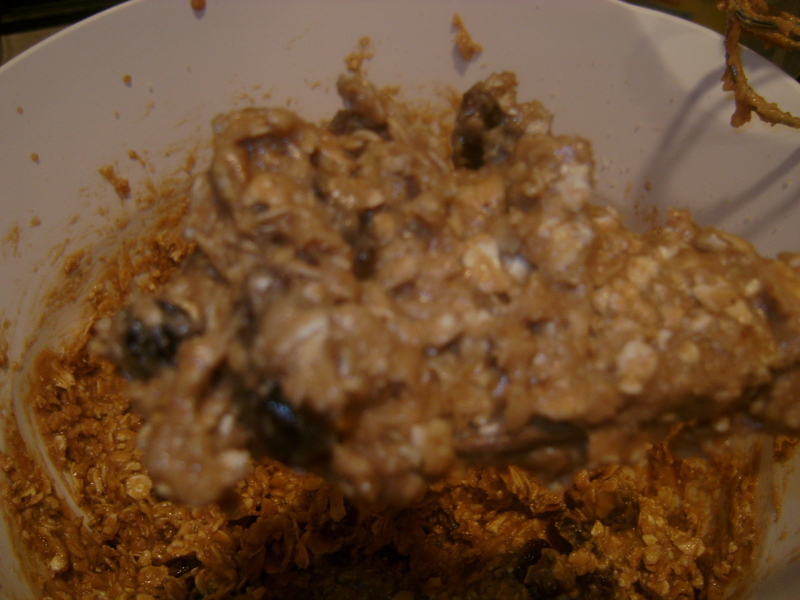 4) Spoon dough into pan, and press lightly to flatten. 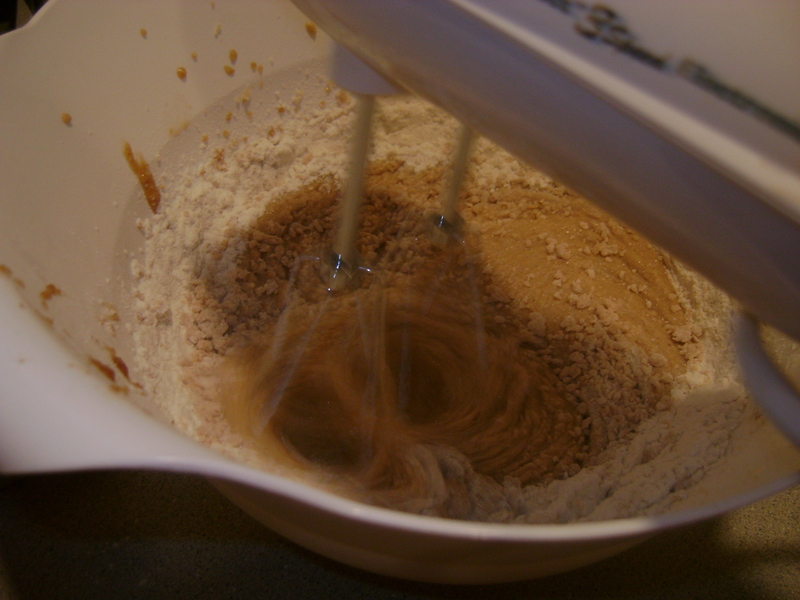 Bake 18-22 minutes or until edges are light golden brown. 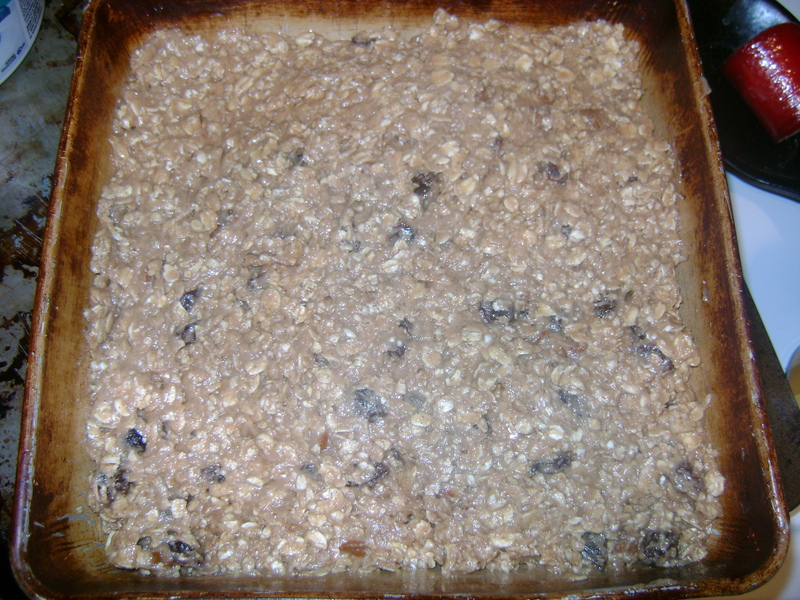 Note: I have a tendency to undercook cookie bars, because once they cool, I think they’re a better consistency. Moist and partially doughy, just how I like them! Careful…you may not be able to stop at one!